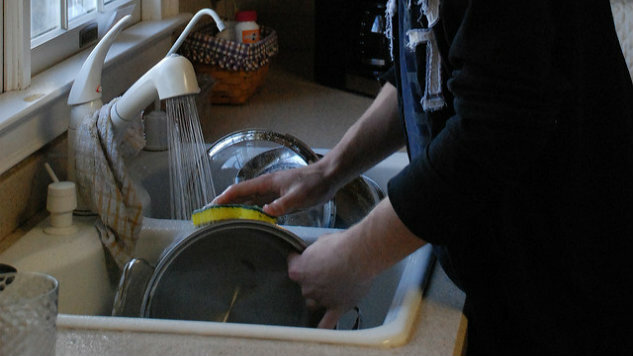 How can washing the dishes change our relationship with water? One summer in college, I lived with my godparents in North Carolina while doing an internship. Perched over their sink one humid summer night washing dishes after a spaghetti dinner, I discovered that even dishwashing methods could be controversial. My godmother watched me fill a small bowl with potently soapy water and use it as a basin from which to wash other dishes. When I told her this was the way my mother had taught me to wash the dishes, she seemed aghast, and told me I should fill the entire sink with soapy water. But my mother, raised with wells on a water-hungry rice farm in rural South Korea, didn’t grow up with an endless supply of clean water — this was how she washed dishes. Water is expensive and precious in Asia, where a wetroom shower is common, in which you don special rubber bathroom slippers, sit on a plastic stool and use predetermined basins of water — ofttimes one clean large supply bowl, and one smaller work bowl for rinsing or mixing or dunking the shampooed head. Sometimes there is a large hand scoop that you can use to dip into your work bowl’s water, so that you can rinse your head with cupfuls of the hand scoop. Either way, you use much less water than a conventional American shower, and you’re really aware of how much you’re using, because you can see how much of the basin water is left. An American friend called this method “crazy.” Is it crazy, or are we in the West crazy, believing that we have infinite supplies of clean water? Throughout my travels across Asia, the West Indies and Mexico, I’ve been struck at how much more expensive and precious water is. In homestays in Cuba, water often seemed to come through filtration systems that emptied into large jugs, and the supply was far from infinite — when we ran out, we had to wait for more filtration to happen, and it seemed to slow to a trickle. I had many cold showers across Southeast Asia, Cuba and Mexico because heating water is expensive and boilers weren’t everywhere. I frequently notice during travels how much less water I drink because drinking clean bottled water requires frequent trips to the store. In Mexico or Vietnam, getting a friend a bottle of water was somehow a larger token of love than it was in the States. As the Lakota say, Mni Wiconi. Water is life. When my friend got me a bottle of water, she was handing me nothing less than a desire that I live. The way we Americans use our water is far from the gold standard around the world. We use 159 gallons a day to the world’s average 25 gallons a day, and we use twice as much as we think we do. “By 2050 a third of the people on Earth may lack a clean, secure source of water,” National Geographic’s Freshwater Initiative wrote. Water is what makes our food possible and delicious, in so many ways. Where would pasta be without potable water, or tofu? What about meat, and vegetables? What would honeybees be without water to sip? What would our bodies be, without the honeybees to keep nature in balance, or without that clean, hydrating sip of water after a hard workout? All of it depends upon water. Water is already more precious than gold, when you think about it. Gold doesn’t keep your cells, organs and tissues afloat, and it can’t sustain your body. The UN has warned that “the planet will face a 40 per cent shortfall in water supply in 2030 unless the international community ‘dramatically’ improves water supply management” and that “demand for water is slated to skyrocket 55 per cent by 2050 while 20 per cent of global groundwater is already overexploited.” If we are to preempt a Mad Max-like era of worshipping water and belonging to those who own it, we need to use our most important resource much more mindfully and work to change water policy around the world. Here are a few easy tips on reducing water usage. I washed my dishes environmentally because it was what my mother taught me. But Thich Nhat Hanh, affectionately known as Thay, or teacher, was the first person who ever made me think about the actual act of washing the dishes — beyond a quick cleanup after a bellyful of food, that is. A friend had loaned me the Vietnamese Buddhist monk’s book The Miracle of Mindfulness, and my life was changed forever. Like kinh hanh, or walking meditation, washing the dishes could be a meditative process, wherein I considered the dishes, how they were made, my muscles, the temperature of the water, and the bubbles. Sometimes, my thoughts would zoom out to environmental water usage, the person who made these dishes, or even my consciousness, but not always. But more and more, my mind wasn’t on the past or the future. Of course I wanted to live all the minutes of my life, truly, so I tried to listen. While I will honestly own up to the fact that I don’t wash the dishes quite that mindfully every time, there have been countless times in my life when I’ve slowed down while washing dishes or performing everyday ordinary actions, and I’ve noticed things I never saw before: a wabi-sabi crack in a beloved jade green ceramic mug my best friend made me; a spider weaving her glistening web above the sink; the rich, vivid yellow of a turmeric stain; a prism of a rainbow in a soap bubble. This is the spirit of nature observance that writer Annie Dillard encourages — nature is fiercely present in everything, if you can see it. Growing up in a family where “Hurry up!” was the common refrain, “washing the dishes mindfully” was a struggle at first, but it soon became a metaphor for the much larger life lesson Thay was trying to teach me, where all our actions are much more connected. I found a synergy and peace in washing the dishes, or cutting my bangs, or walking a friend’s dog, or even choosing the groceries, mindfully. If we apply these methods of mindfulness to our usage of that most important ingredient in dishwashing, water, then we realize that this life-giving force that cleanses is precious, and should be treated accordingly. On the farm where I live, we draw from well water and have composting toilets, which I don’t exactly love. But did you know that you’re definitely using over a gallon of water and probably as much as 3.5 gallons every. single. time. you flush? Did you know that toilet flushing accounts for 28 percent of household water usage? I was horrified when I found that out. We also don’t flush every time we use our conventionally-plumbed toilets, if you know what I mean. You might think these methods are radical, but what’s more radical is a drought the likes of which California faced recently, and which Illinois faced when I was a child. How can we apply these methods of mindfulness to other parts of our food world? On a personal level, we can start by educating ourselves. Many of us may be food lovers and cooks, but we may not even know where our own water comes from (if you’re in New York, it comes from these reservoirs and their watersheds; if you’re in Atlanta, your water mostly flows from Lake Lanier and the Chattahoochee River and your water has already been part of a tri-state water war). We can measure our water footprint — it’s fun, easy and interesting to know how much you’re using and how you can easily lower your usage. On a personal level, we can buy natural products and resist products that pollute waterways, such as leather, which not only hurts the environment but also its workers. We can stop supporting factory farms that pollute our waterways. We can eat less beef, since per the Freshwater Initiative, 338 gallons of water are used to produce one three-ounce serving of beef (and I know some of us are eating the 10-ounce). The average person uses electricity that uses hundreds of gallons of water a day, so we can pick green energy options (even mainstream providers such as Con Ed offer these options). Around our houses, we can do so much too. We can plant drought-resistant gardens including crops like beans and we can observe with mindfulness how all the insects and plants and air and water work together in our little plots. We can install and use the low-flow flush option on toilets whenever possible (note: the smaller button is almost always the low-flow flush, even if it depresses both the buttons). When it comes to filling our fridges, we can choose beers like the Patagonia Provisions Kernza beer, Long Root Ale, which prevents soil erosion, and thus the loss of water, with its extensive root system. But so much change on water policy is going to have to be larger than that. On a public or political level, we can read books and media to keep ourselves informed. We can petition with the people of Flint, Michigan and millions of others worldwide as they struggle to get access to and afford clean water. We can consider the effect of oil spills like those of the BP-leased Deepwater Horizon in the Gulf of Mexico in 2010, follow organizations like Riverkeeper to monitor oil operators like Global Partners LP, and learn how oil spills affect fish and drinking water. We can exercise our rights as part of a participatory democracy and call our Congress reps to ask them what they’re doing to ensure our children’s and grandchildren’s water safety, and we can pressure corporations to be more water efficient and environmental. Great water makes great food, great beer and great cocktails. One of the most delicious beers I’ve ever had was made with Icelandic glacier water. I can tell you for sure that that beer, and that water, and that glacier, are worth preserving, so we can drink beer and scrub pint glasses — mindfully, of course — for generations of delicious drinking and living to come.